The main systems of tuning, their qualities, and why and when they should be used. 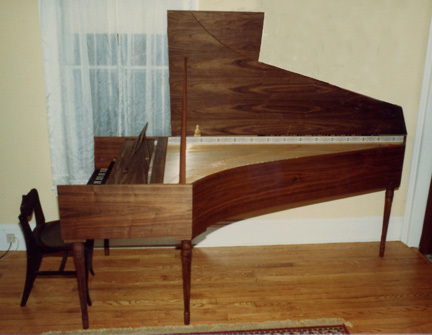 A two manual harpsichord constructed by Robert Chuckrow. • Why not use equal temperament for all music? • Summary of Equal-Temperament, Meantone, and Well-Temperament systems. • Graphical comparison of frequencies in different tunings/temperaments. • Aron-Neidhardt 1/4 syntonic comma Well Temperament: Download a simple scheme for tuning it. • Thomas Young 1/6 ditonic comma Well Temperament 2: Download a simple scheme for tuning it. • Meantone Temperament: Download a simple scheme for tuning it. • The distinction between a tuning and a temperament. • Information about Robert Chuckrow’s book on historical tuning (enables even those with very little knowledge of music theory or mathematics to achieve a historical and theoretical understanding of tuning and the ability to tune in meantone and well temperament). • Why the octave of a note sounds the same but higher in pitch. • Beats: Understand and hear them. • Harmonics of a vibrating string and their frequency relationships (with audio illustrations). • Understand why tempered intervals beat (with audio illustrations). • Understand why octaves are stretched. • Decibels: An intuitive explanation. • Links to other web sites on historical tuning. • Information on recordings of music in historical temperaments. • Visit Robert Chuckrow’s web site on T’ai Chi and other health-related subjects. This website was updated on September 6, 2016.